Oscar Handlin - one of the nation’s most distinguished historians, who pioneered the study of US immigration and whose book “The Uprooted: The Epic Story of the Great Migrations That Made the American People’’ received the 1952 Pulitzer Prize for history - died Tuesday at his Cambridge home. He was 95. The cause of death was a heart attack. Dr. Handlin taught at Harvard for almost half a century. He was Carl H. Pforzheimer University Professor and, later, Carl M. Loeb University Professor (a university professorship is the highest honor Harvard reserves for faculty). He was university librarian from 1979 to 1984 and acting director of the Harvard University Press in 1972. The author of more than 30 books, he wrote on a broad range of historical topics: family, education, race, freedom, and historiography. Dr. Handlin also frequently wrote for newspapers and magazines. An exacting stylist, he emphasized the importance of clear and vivid expression in the writing of history. Teaching was no less important to Dr. Handlin than writing or research. Many of the approximately 80 doctoral students he supervised went on to notable academic careers, among them Bernard Bailyn, Martin Baum Duberman, Sam Bass Warner, Stephan Thernstrom, and Richard Sennett. “An extraordinary man,’’ Robert Fogelson, another of those students, said in a telephone interview yesterday. “He was a great historian, a superb scholar, and a wonderful teacher,’’ said Fogelson, a professor of history and urban studies at MIT. “What made him so extraordinary was not simply that he did such extraordinary work of his own but that he guided so many other scholars. The son of Joseph and Ida (Yanowitz) Handlin, Oscar Handlin was born in Brooklyn. His parents were Russian immigrants. He entered Brooklyn College at 15. Four years later, he began graduate school, at Harvard. During his university studies, Dr. Handlin had begun demonstrating his prodigious memory: He never took lecture notes. 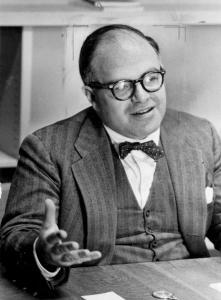 It was Arthur Schlesinger Sr., Dr. Handlin said, who “directed my attention to the subjects of social history that have since occupied much of my attention.’’ Schlesinger also urged Dr. Handlin to write his dissertation on immigration to Boston in the late 18th and early 19th centuries. The book marked a turning point in the study of Boston, which had been the province of the antiquarian and nostalgist. It also demonstrated Dr. Handlin’s capacity for hard work: In assembling his data, he transcribed entries for 43,567 immigrants. Dr. Handlin taught at Brooklyn College from 1936-38. He joined the Harvard faculty in 1939 as an instructor and remained there until retiring in 1984. In 1972-73, he held the prestigious Harmsworth professorship in American history at Oxford University. He helped set up Harvard’s Center for the Study of the History of Liberty in America and served as its director from 1958-67. He was chairman of Harvard’s Charles Warren Center for Studies in American History from 1965-73. From 1962-65, Dr. Handlin was vice chairman of the United States Board of Foreign Scholarships (better known as Fulbright scholarships) and was chairman from 1965-66. He served on the board of overseers of Brandeis University and was a trustee of the New York Public Library. Among the better-known titles Dr. Handlin wrote or edited are “The American People in the Twentieth Century’’ (1954), “The Harvard Guide to American History’’ (1954), “Chance or Destiny’’ (1955), “Race and Nationality in American Life’’ (1956), “Al Smith and His America’’ (1958), “The Dimensions of Liberty’’ (1961), “Children of the Uprooted’’ (1966), “The American College and American Culture’’ (1970), “The Harvard Encyclopedia of American Ethnic Groups’’ (1980), and “Liberty in America, 1600 to the Present’’ (1986). Dr. Handlin collaborated on several books with each of his wives. Mary (Flug) Handlin died in 1976 after 39 years of marriage. He married Lilian (Bombach) Handlin in 1977. Among Dr. Handlin’s hobbies were music and the outdoors. He was an accomplished bassoonist and an enthusiastic alpinist. In addition to his wife, Dr. Handlin leaves a brother, Nathan, and three children from his first marriage: David of Lexington, Joanna Handlin Smith of Cambridge, and Ruth Handlin Manley of Guilford, Conn. He also leaves four grandchildren and a great-grandchild. A memorial service will be held later. Globe correspondent Edgar J. Driscoll Jr. contributed to this obituary. Mark Feeney can be reached at mfeeney@globe.com.